As you probably know videos come in all sorts of shapes, sizes, and formats. In most cases you won’t have to worry about any of that – but at times it can be useful to know how to resize your videos or convert their format. By resizing your video and adjusting its resolution you can optimize it for the screen that you’re viewing it on – as there is no benefit in watching a high resolution video on a display that doesn’t support it. Being able to convert its format is just as useful – as it will help ensure your videos are compatible with any device or platform. Fortunately Movavi Video Converter will make it easy to perform either task. Once you add a video to it, you can choose the format that you want to convert it to and also resize it to any resolution that you see fit. Within Movavi Video Converter you’ll find several different methods that can be used to resize your videos. It has a ‘Smart Fit’ option that will adjust the size to as big as it can be to fit into a particular frame, or a ‘Up to Size’ option that will do the same but will not enlarge the video if it already fits. Of course you could also resize videos by a percentage of their original size, or to a specific resolution of your choice. Needless to say Movavi Video Converter can do far more than just convert videos and resize them. Its features are really quite extensive, and can be used to convert audio and image files, compress videos, extract audio tracks, grab screenshots, or create animated GIFs. Additionally if you feel like tweaking or improving your video then the editing features in Movavi Video Converter may prove useful. 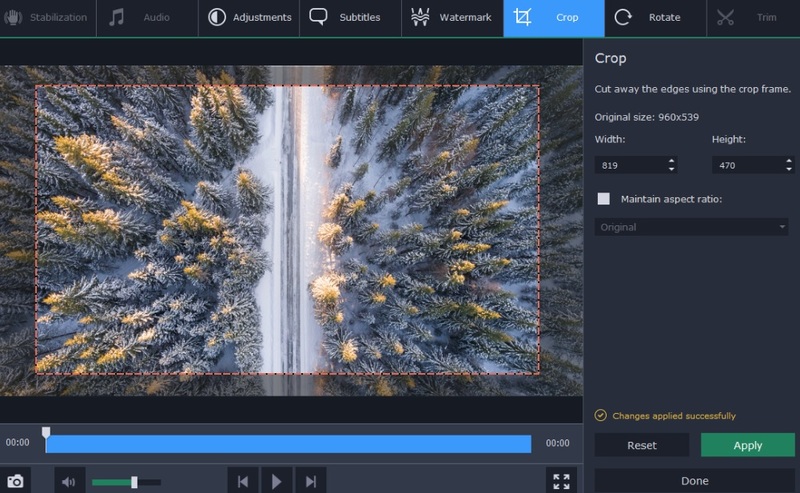 While it isn’t a full-fledged video editor, it can trim out unwanted segments of video, merge clips together, insert customizable text fields, enhance the video quality, and crop or rotate the frame. If you’re really only interested in resizing and converting your video formats for now you needn’t delve into the other features in Movavi Video Converter just yet. Still, it may be useful to familiarize yourself with them – as they will probably come in handy at some point or other and could prove invaluable.